Windsurf boards - does rail bite make sense? The bite (or grip) of the leeward rail. Please note that the words below are propelled from pure curiosity - not from knowledge. For practical reasons not all sentences can end with a question mark, but do keep in mind, that all over this article hangs one big question mark! You very often hear from good riders that when they tilt the board to the leeward rail, the rail gives them a lot of bite or grip, allowing them to go higher to the wind. Another phrase you hear, is that when you dig the leeward rail into the water, the board gets a lot of lateral resistance, again allowing the board to go higher to the wind. It's especially when talking about formula boards or larger slalom boards that you hear this phrase. I think all of us have experienced the wonderful sensation that if we succeed in lifting the windward rail of the board, it's possible to gain a lot of height - but is this really because of the "grip" or "bite" of the leeward rail? the rails towards the stern. 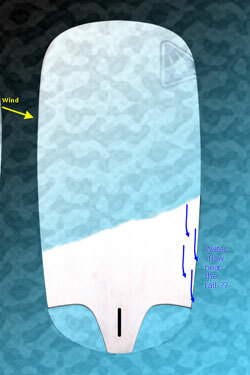 If a board had no drifting at all, the the rails in the water (the aft parts of the rails) would have to be ("at least") parallel sided to offer you some lateral resistance. Now, all boards drift a bit (mostly when gaining height), and consequently the boards are allowed to taper a little towards the stern - and (in theory) still offer some lateral resistance. In figure 1 a Gaastra Vapor formula board (seen form under water, hope you can imagine!) is provided with a couple of lines and arrows to illustrate this. The Gaastra Vapor must be about the most "parallel sided" board around these days - and still you might wonder, if the drifting angle when gaining height really has a proportion, so that it matches or exceeds the taper angle of this very parallel sided board. And of course, this shall be even more relevant when we talk about older formula boards or (large) slalom boards with more taper towards the stern. The fig. 1 also illustrates the difference in this respect between the 2008 Gaastra Vapor 2008 and the 2005 Starboard 159. As said, I'm not in a position to answer questions at all. All that is indicated, is that this might be worth examining more closely: What is the "normal" drifting angle of a board that gains height relative to the taper angle of the rearward parts of the rails? And does the drifting angle really exceed the taper angle of the aft rail of the board? In figure 2 the Gaastra Vapor is once more used as illustration of this (claimed) phenomenon. My impression is, that the water flow around the leeward rail is separated by the rail. 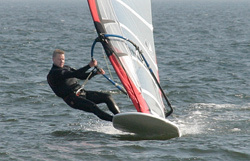 The water flow under the board/close to the rail is moving in an almost straight line (in the opposite direction to the true sailing direction of the board). The water flow along the (slightly) curved rail shall of course have to travel a little further than the straighter water flow under the board. tendency that a buried leeward rail acts against the lift of the fin. pressure areas just "outside" the rails. A planing board is of course displacing water, and most of the water escapes behind the stern. But close to the rails there will be a tendency for some of the water to escape from under the board to the "freedom" along the rail. Figure 3 tries to show this (claimed) phenomenon, that we all experience as splashes along a submerged rail. But if this is so, then it shall of course be even more difficult to gain lateral resistance from the leeward rail. Or put in another way - if there is a tendency for the water flow just below the rail to move away from the board and rail, it shall be pretty difficult for the rail to get any "bite". Of course, the above mentioned factors will be interrelated. However, already being on the edge (or beyond) of my theoretical capacity I shall refrain from exposing my very limited knowledge any further for now. Instead it could be more interesting to discuss what might be some more real life positive effects of tilting the board to leeward, rather than this much talked about "rail bite". 1. Tilting the board also means tilting the fin, so that the fin not only keeps the board on course sideways - it probably also lifts the board a little out of the water. Perhaps a little like a hydrofoil boat. A very soft and flexible fin kind of creates this "upward lift" almost automatically, but especially with a harder fin I think you might benefit from this sailing style of tilting the board. Or put in another way: Perhaps the "tilting the board" style isn't a cause but rather a symptom that you're succeeding in getting your fin to work properly? 2. Especially in rougher conditions a tilted board shall not bounce as much as a more level board. The leeward rail kind of "ploughs" through the chop, probably making the sailing a little more calm and adding to the controllability.